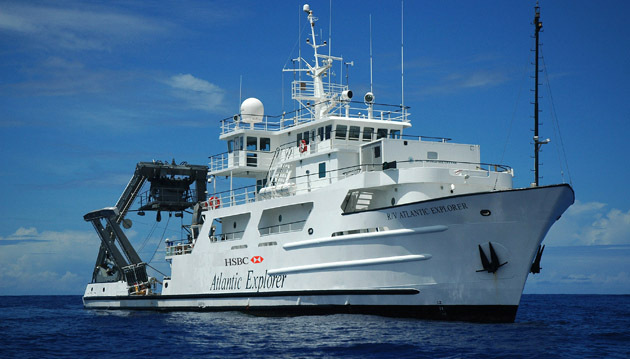 To maintain the unparalleled 27-year record of natural ocean processes and human-induced change at the Bermuda Atlantic Time-series Study (BATS) site, four BIOS research technicians work to collect monthly measurements at sea, process samples in the lab, and analyze incoming data. Over the past year, each of them has also gone beyond their basic duties with research forays into the time-series dataset. 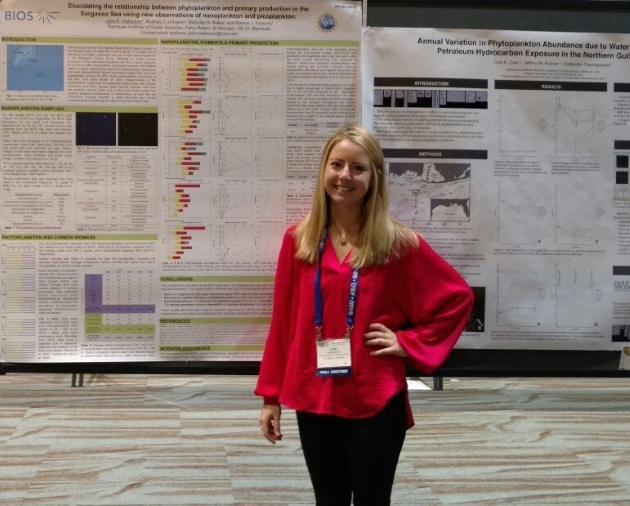 This month, the four traveled to New Orleans, Louisiana, to present their results at the 2016 Ocean Sciences Meeting. 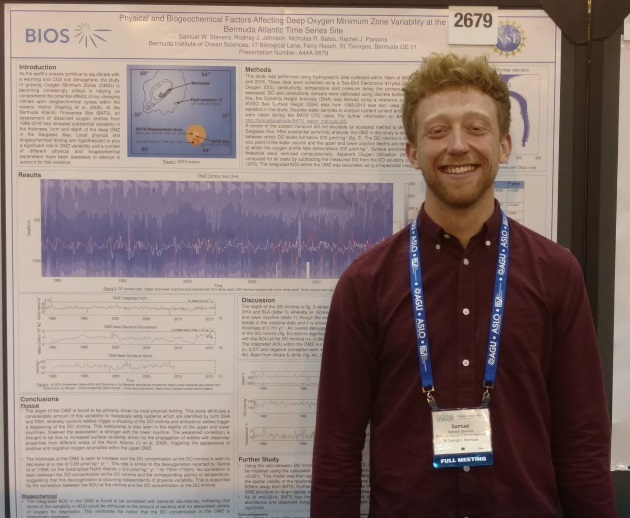 The meeting, co-hosted by the American Society for Limnology and Oceanography, the American Geophysical Union, and the Oceanography Society, attracts approximately 4,000 attendees and is the premier meeting for ocean scientists working across a broad range of disciplines. BIOS scientist Rod Johnson, who oversees the BATS research program in collaboration with BIOS scientist Nick Bates, said he encourages technicians to take on research projects leading to publication and presentations at professional meetings to expand their professional development at BIOS. Julia Matheson came to the team with a strong background in microbial oceanography. She has been working to unite microscopy methods with pigment measurements for a more robust metric of “who’s doing what” among the tiniest phytoplankton. While photosynthetic pigments from plankton are routinely measured throughout the water at BATS to identify the presence of broad groups of plankton at the site, more quantitative data will illuminate how specific groups contribute to the base of the food web and nutrient cycling. Matheson has used microscopy to track the “boom and bust” reproduction of unique plankton groups throughout the year, and then combined this community structure data with the time-series pigment data to create a stronger assessment of plankton productivity at the BATS site. Sam Stevens has been investigating the oxygen minimum zone, a feature approximately 800 meters below the surface at the BATS site. Every day around the world, billions of tiny zooplankton and fish swim downward to spend the daylight hours in the dark, away from the eyes of predators. They then undertake a nightly reverse commute to the surface, to feed on the plankton that spent the day growing in sunlit waters. Because these animals consume oxygen from the water, the sheer number of them amassing at depth quickly depletes the oxygen there. Microbes breaking down detritus use oxygen too, compounding the effect of the vertically migrating animals to produce a zone with a stark oxygen deficiency. In Bermuda, the microbial oxygen use actually surpasses that of the migrating plankton. Stevens has been using the full 27-year BATS dataset to study how the depth of this zone changes when mesoscale eddies churn through the BATS site, finding that eddies can push this feature deeper or shallower depending on whether the eddy spins clockwise or counterclockwise. Because most animals can’t survive in the heart of the oxygen minimum zone, the depth of this feature is a meaningful boundary with important consequences for marine life. Afonso Goncalves Neto has been studying the drivers behind the annual average 3.3 millimeter sea level rise in Bermuda. With some reports predicting extreme sea level rise in the coming century, understanding the processes behind current sea level rise is of the utmost importance for climate scientists. Can sea level rise be attributed to additional water; for example, due to the melting of polar ice or shifts in rainfall? Or have changes in salinity or temperature caused seawater to expand, and consequently raised the water level? To get to the heart of these questions, Goncalves Neto analyzed data from the long-term tide gauge in Bermuda in conjunction with the 27-year record of temperature and salinity throughout the water at the BATS site. Like a layer cake, the ocean has distinct water masses of different densities, with the densest, cold and salty waters flowing along the seafloor, and the least dense waters at the surface. 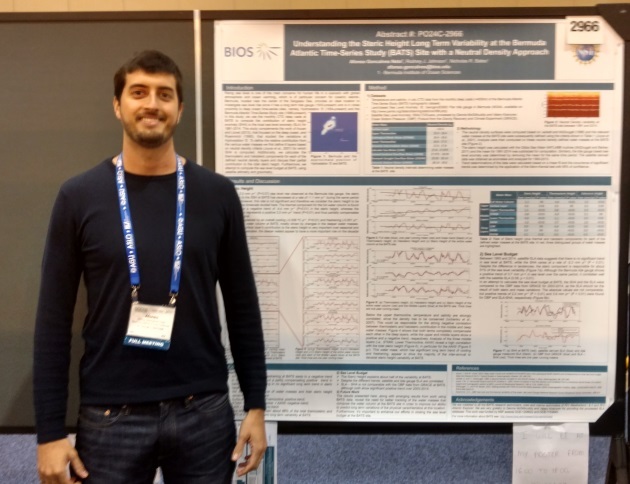 Goncalves Neto identified eight distinct water layers at the BATS site, and then used the time-series dataset to calculate how each of those layers has changed over time. He found that although surface layers have warmed and expanded, deeper layers have cooled and contracted, offsetting any major impact from these processes on sea level height. The results suggest that additional water has likely contributed to the bulk of the annual rise in sea level observed at the tidal gauge. 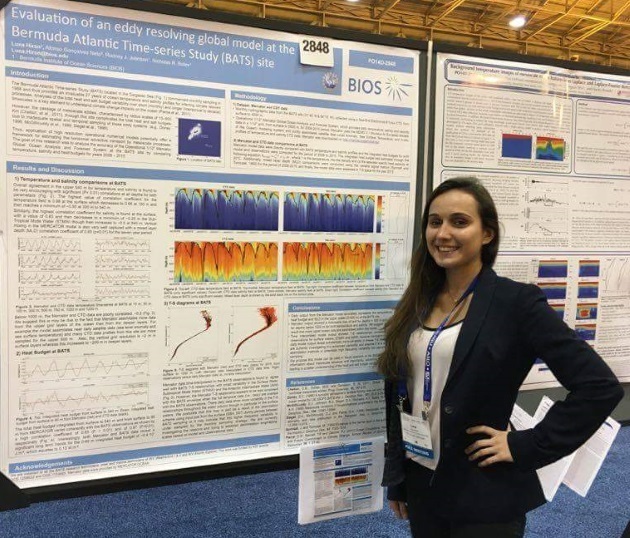 Luna Hiron has been working with a three-dimensional ocean forecasting model called MERCATOR to better understand physical processes at the BATS site. Two decades ago, BIOS scientists established that if researchers account for all the inorganic and organic forms of carbon every month during the summer, by the end of the season there is a net loss of carbon, presenting a deficit in the budget that should be “closed.” Likewise, the amount of heat in the water at BATS is often gained or lost from month to month. The primary suspect behind these deficits is advection, as fluids flowing horizontally can transfer heat or matter away from or to the site. Advection is not accounted for in simpler models, but MERCATOR’s three-dimensional forecast of conditions from the deep ocean to the surface for any location in the world includes the advective processes at play. Hiron is using the forecast for the BATS site to test whether advection can “close the budgets” at BATS from month to month. By comparing the temperature and salinity predicted by the model with the real measurements recorded at the BATS site over the past eight years, Hiron has found the model captures the real variability at BATS and can provide estimates of advection at the site for future studies.